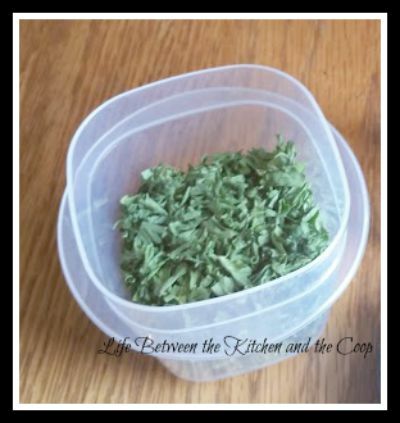 Food preservation, especially preserving fresh herbs can sometimes be tricky, but drying parsley is soooo easy. 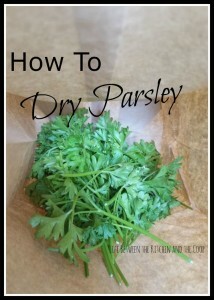 If you use parsley a lot in your cooking, you need to learn how to dry parsley! 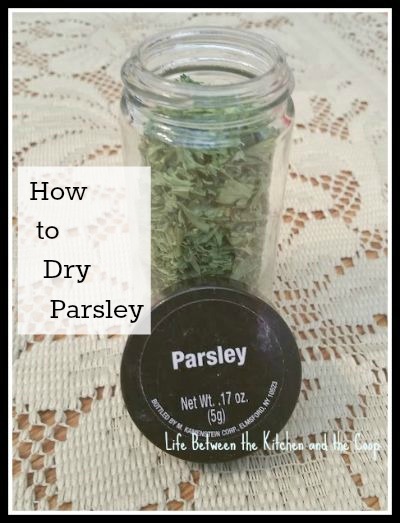 Learning to dry parsley will help you have home-grown parsley to use for your cooking all year round! It is also great to get some surplus built up (I just throw it in a mason jar) to put in your food storage. We dried our parsley like this last summer and just barely ran out, so it is time to refill the parsley jar in my spice rack again. It’s so easy! 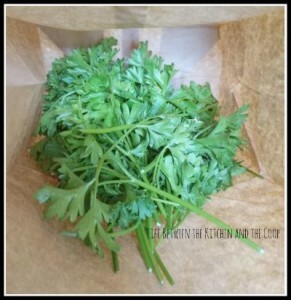 After you pick your fresh parsley wash it, let it air dry (you can speed up the drying by blotting lightly it with a paper towel if you like), and then place it in a paper bag. 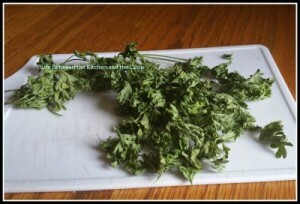 Once the parsley has completely dried out, remove the stems and break the parsley up into little bits. Once I have dried and prepared the parsley, I just refill the spice jars on my Kamenstein revolving spice rack (love that thing-it’s so handy having almost all of my spices right there next to the stove and it comes with FIVE YEARS of free spice refills, which comes in handy for the spices that you don’t grow in your own garden!). 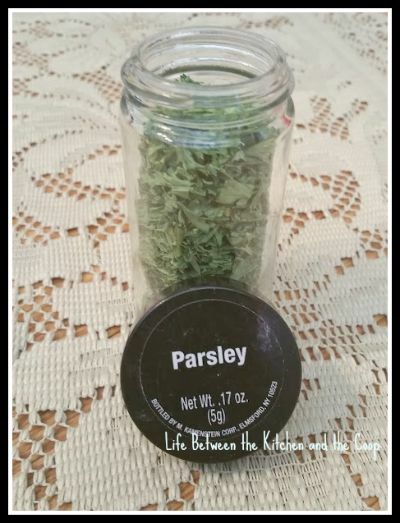 Place the dried parsley in the spice jar and seal it with the lid (if you have a lot, a mason jar works great, too!). We grew more parsley this year than last, so I think we will have a little more surplus for food storage. 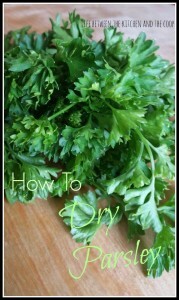 Pssstt…We have also used this tip for drying fennel seed (which is a MUST in my yummy marinara) and cilantro. Having homegrown dried herbs on hand is such a great addition to whatever you cook. Be sure to follow my emergency preparedness, food storage, and self-sufficiency board on Pinterest for more great tips! What are your favorite herbs to preserve? P.S. Click here for more tips on food preservation and food storage! Next story Check Out our New Monthly Starbucks Gift Card Giveaway! Hey Debra, I always had a little trouble drying out my herbs. This is working great...the paper bag is the key! thanks for the help. I'm glad it's helping! That was my husband's idea! do you dry fennel the same way? I hnt to do moreave a fennel plant but I am not sure when to pick it. I am new at this but want to do more. We dried some fennel last year, Debbie. He did not do it in bags like we did the parsley. It might work, but that's not what we did. We tied it in bundles and hung it upside down for a week or two outside (until it was completely dried out). Hope that helps! Where can I find a real paper bag? lol Oh, dear. Are your stores hiding them? I find paper lunch sacks near the aluminum foil and saran wrap at the store. I usually just use several of those. :) Good luck!